Why Buy 2 When 1 Will Do? While other multiprocess units lack the ability to TIG weld aluminum, your Syncrowave 210 has AC TIG. Also through the spool gun accessory you can MIG weld to fill those gaps or increase your travel speed. Allows users to weld thinner materials than other machines in this category. Eliminates the guesswork when setting weld parameters. Use Pro-Set when you want the speed, convenience, and confidence of preset controls. Simply select the feature and adjust until Pro-Set appears on the display. AC Balance Adjustability (TIG): Provides adjustable oxide removal which is essential for creating the highest quality aluminum welds. Pulse Capability (TIG): Pulse feature ranging from 0 – 150 pulses per second for increasing puddle agitation, arc stability, and travel speeds while reducing heat input and distortion. A breakthrough control that automatically sets your welder to the proper parameters. Auto-Set offers all-in-one MIG minus the hassle of finding parameters. When the competition snuffs out the Syncrowave 210 burns on, even with difficult to run electrodes used for less than ideal conditions. Increase the DIG setting for stiffer, more penetrating electrodes like E6010. 1. Turn power on. 2. Select Process: AC TIG, DC TIG, DC Stick or MIG Spool Gun. 3. Set amperage or voltage based on material thickness. Then weld! It’s as easy as 1, 2, 3. Using Miller’s Auto-Line™ technology, the Multi-Voltage Plug (MVP™) allows you to connect to common 120 or 240 V power receptacles without the use of any tools – simply chose the plug that fits the receptacle and connect it to the power cord. No need to buy a cart, your Syncrowave 210 gives you maximum portability with an EZ-Change™ low cylinder rack and built-in storage space to better manage your accessories and easily transport everything you need for your project. The standard 14-pin connector on your Syncrowave 210 lets you choose your control for a customized experience, whether it’s a foot control, fingertip control, or wireless foot control. Miller Weld Technician Mark Kadlec explains the benefits of AC frequency control. Miller Weld Technician Mark Kadlec demonstrates the Miller balance control feature and provides instructions for proper use. Troy Ladd and Paul Bosserman of Hollywood Hot Rods complete the custom bumper using the Syncrowave 210 TIG welder. 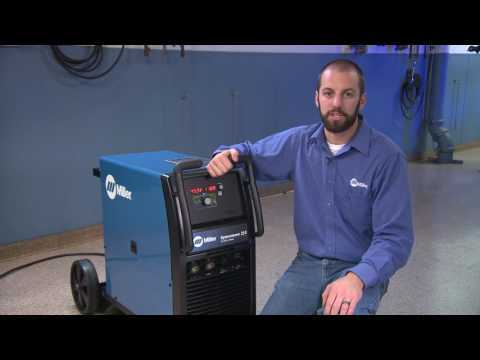 TIG Product Manager Devan DePauw talks about the Syncrowave 210 TIG/MIG Complete with Spoolmate™ 100 spool gun from Miller.